by Victoria Boutenko Author · A. William Menzin, M.D. Author of introduction, etc. Everyone knows they need to eat more fruits and vegetables, but consuming even the minimum FDA-recommended five servings a day can be challenging. In Green for Life, raw foods pioneer Victoria Boutenko presents an overlooked powerhouse of nutrition in this equation: greens. For their bounty of minerals and nutrients, greens exceed other vegetables in value. Green for Life details the immense health benefits of greens and suggests an easy way to consume them in sufficient quantities: the green smoothie. This quick, simple drink benefits everyone, regardless of lifestyle, diet, or environment. Green smoothies eliminate toxins, correct nutritional deficiencies, and are delicious as well. Green for Life includes the latest information on the abundance of protein in greens, the benefits of fiber, the role of greens in homeostasis, the significance of stomach acid, how greens make the body more alkaline, the healing power of chlorophyll, and more. Also included are the results of a pilot study demonstrating the effectiveness of adding just one quart of green smoothies a day to one's diet, without changing anything else in dietary intake. Green smoothie testimonials and recipes give readers confidence and motivation in exploring green smoothies for themselves. This updated edition offers important new research on the role that omega-3 and omega-6 fatty acids play in metabolic health and includes nutritional data on select green smoothies and updated findings on organic versus conventional produce. 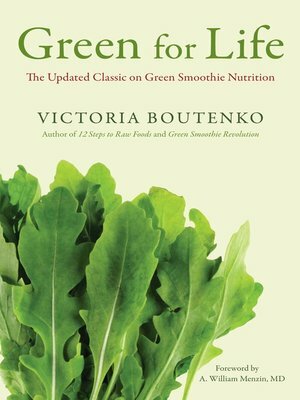 Offering more in-depth nutritional and experiential information than Boutenko's recently released Green Smoothie Revolution, Green for Life makes an ideal companion piece to its recipe-rich successor.